Traveled very slowly today. Pass through Urbana, Piqua, and other places and reach Columbus at 4 P.M. March through the City to Camp Chase and take quarters in barracks. On the 14th at 5 p.m. our train reached Columbus and we marched out to camp Chase, four miles. Some spacious vacant barracks were assigned to us. The soldiers of the 16th Ohio were quartered at Camp Chase, about five miles west of the Columbus, Ohio, train station, eagerly awaiting final mustering out of the army and to be done with the hardships of war. 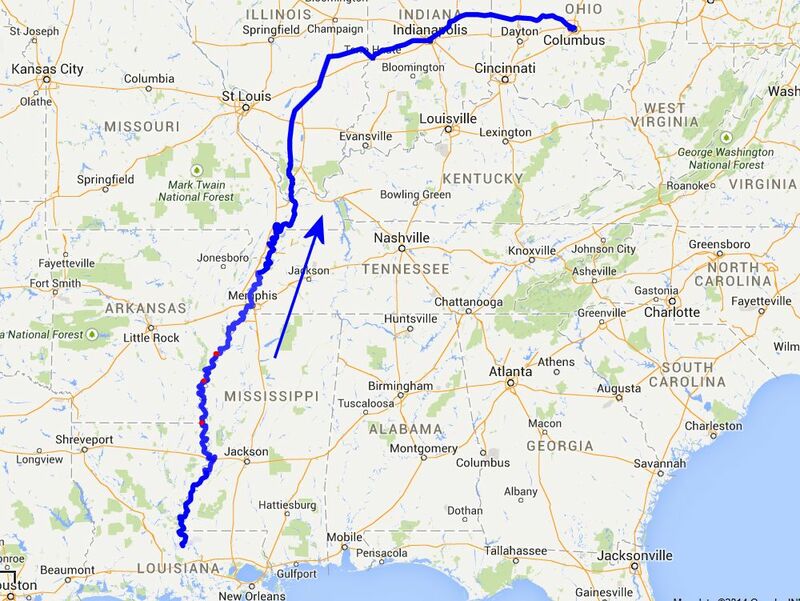 The regiment's trip home took nine days, covered 640 miles by steamboat, from Milliken's Bend, Louisiana, to Cairo, Illinois, and 456 miles by railroad, from Cairo, Illinois, to Columbus, Ohio, for a total of 1,096 miles. 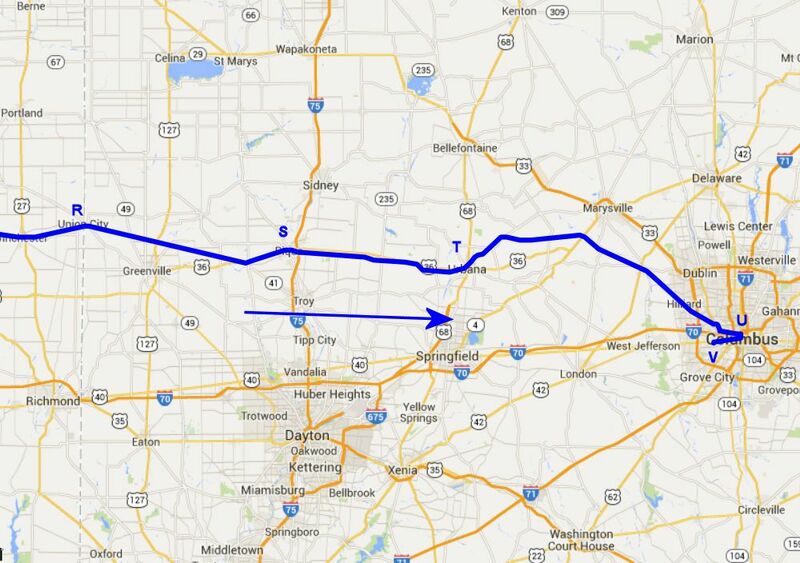 This period map of Ohio shows the approximate route of the 16th Ohio on their trip home from the war. 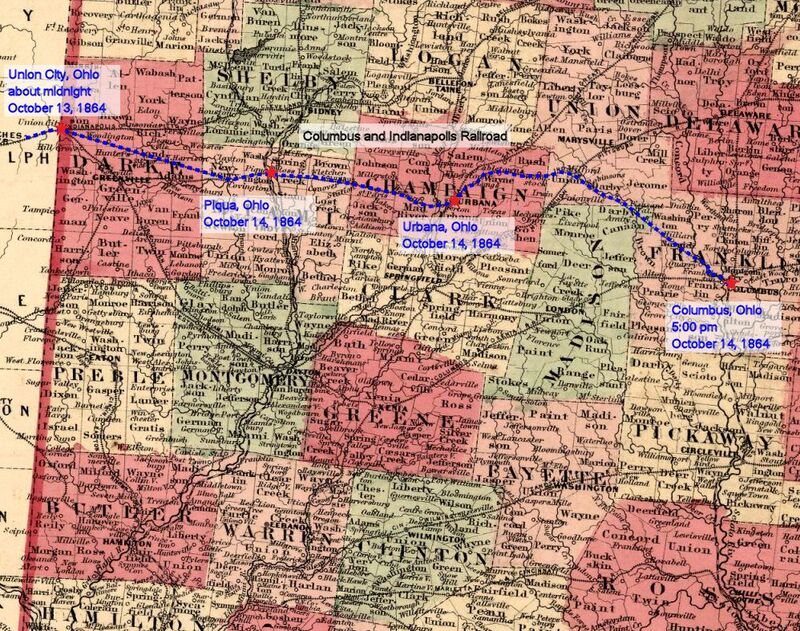 This is the final segment of their journey, from (approximately) Union City, Ohio, to Columbus, Ohio, arriving there about 5:00 pm, October 14, 1864. R - The 16th Ohio travelled from Indianapolis, through the evening hours. Without knowing exactly where they were at the end of the day on October 13, we will estimate they reached Union City, Ohio, directly on the border with Indiana, and where they would change trains for the last time as a military unit. The troops are now less than 100 miles from Columbus, Ohio. S - Piqua, Ohio, a town passed through on October 14, 1864, by the regiment on it's way to Columbus and confirming the particular railroad taken by the troops. T - Urbana, Ohio, a town passed through on October 14, 1864, by the regiment on it's way to Columbus and confirming the particular railroad taken by the troops. U - Columbus, Ohio, the troops' final destination as an organized military unit, arriving here at 5:00 pm on October 14, 1864. V - Camp Chase, Ohio, about five miles west of the Columbus train depot, and where the regiment made its final march in the late afternoon or evening of October 14, 1864. The regiment would be provided quarters here while they awaited mustering out. 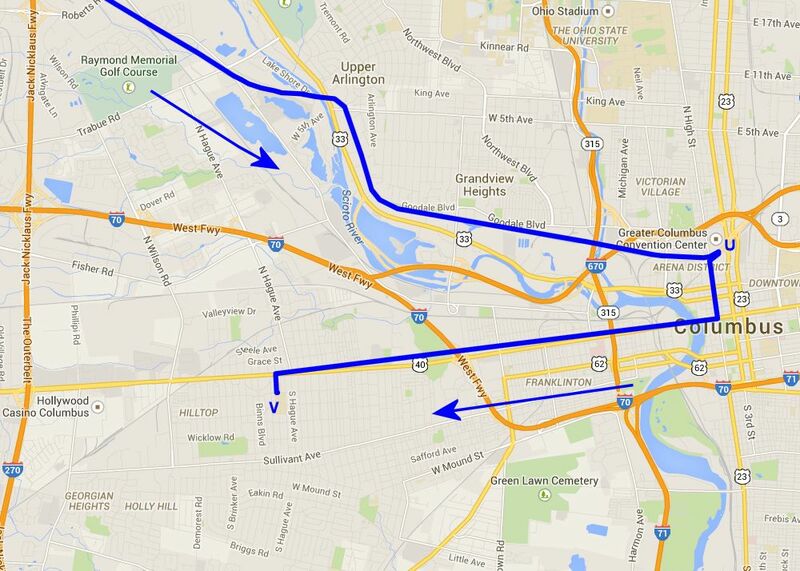 Close view modern day map showing the approximate route and location of the 16th Ohio upon its arrival in Columbus, Ohio, and subsequent march to Camp Chase, five miles west, where they would await mustering out. V - Camp Chase, Ohio, about five miles west of the Columbus train depot, and where the regiment made its final march in the late afternoon or evening of October 14, 1864. Wide view modern day map showing the entire route taken by the 16th Ohio on its trip home from the war. 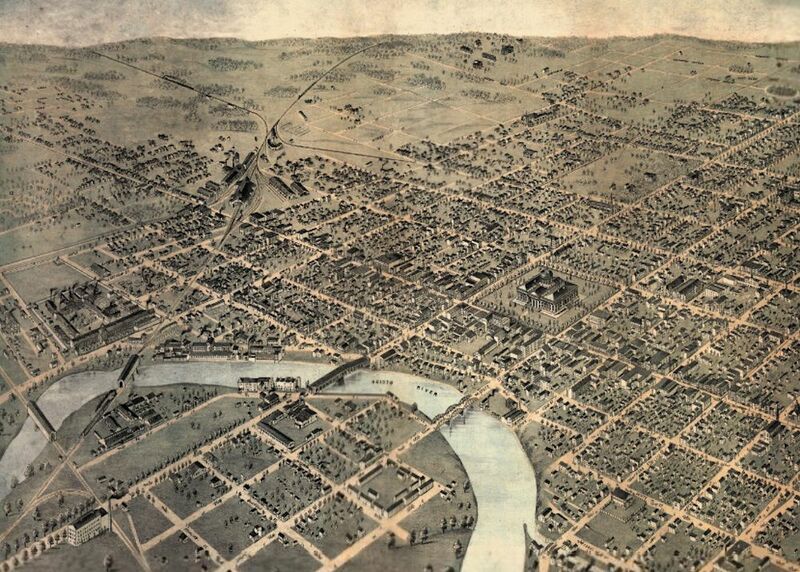 Period view of Columbus, Ohio. The Union Depot (Union Station) can be seen at upper left of city area. The troops disembarked the train, here, and marched back across the river and west to Camp Chase, about five miles away. View of the Columbus, Ohio, Union Depot (the first of several). This is where the 16th Ohio would have arrived home from the Civil War. 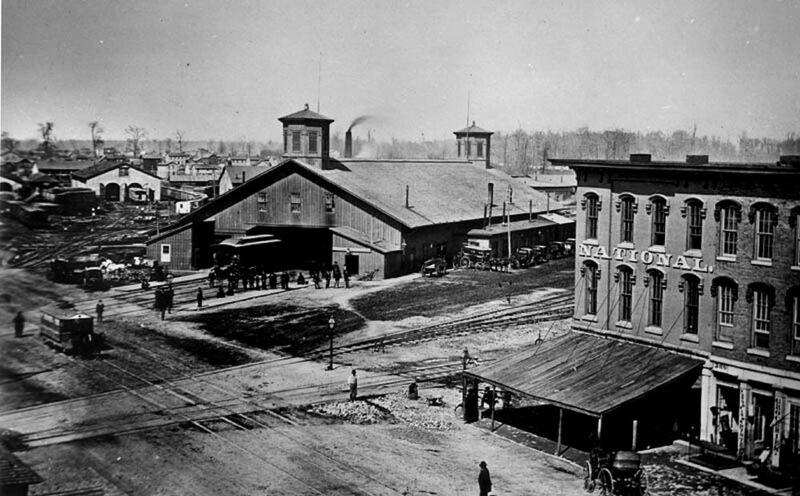 This is the station where, a few months after the 16th Ohio passed through, on April 29, 1865, Abraham Lincoln's funeral car would arrive with his casket then taken to the Ohio State House, a few blocks away, for public viewing. 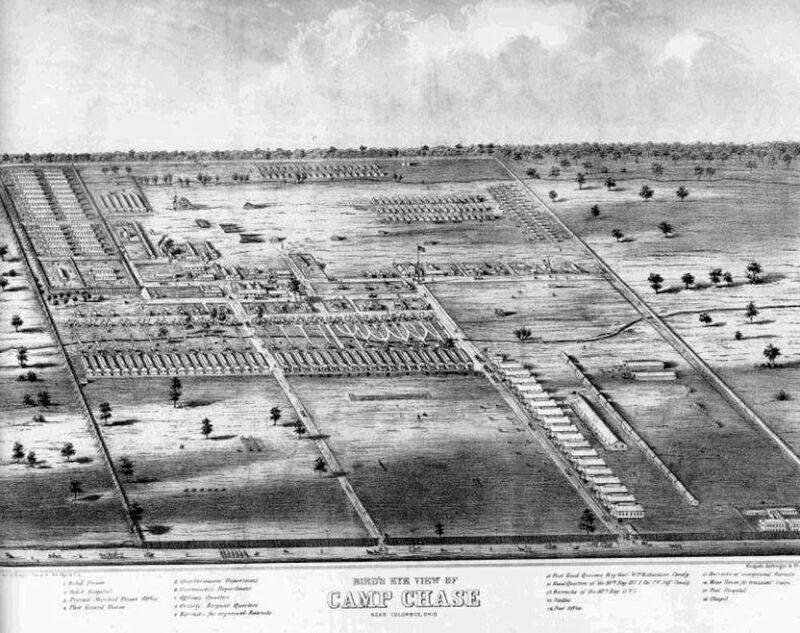 Period sketch of Camp Chase, Ohio, where the 16th Ohio would be quartered on October 14, 1864, awaiting final discharge from the army. The rather small, six-acre camp was bordered by Broad Street on the north, Hague St. on the east and what would become Sullivant Avenue on the south. The only remnant of the camp, today, is a Confederate cemetery. The camp was used as a prison for Confederate prisoners and to organize or discharge Union military units going to or coming home from the war. 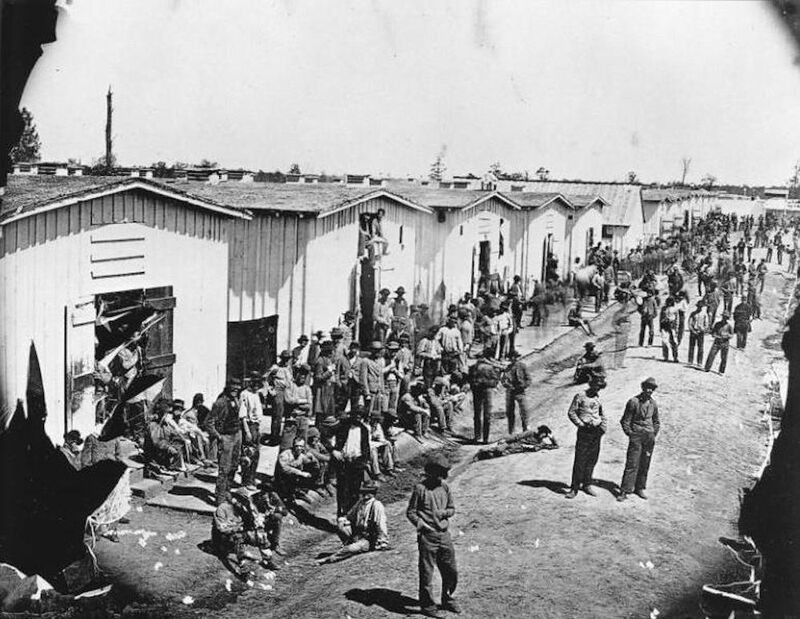 This is a photo of the prison portion of Camp Chase, showing Confederate prisoners and their shelters. No photo has yet been found of the U.S. military barracks or other structures at the site.